If you have no time or patience to read the complete post, feel free to jump to my summary. There are 4 big telecommunication companies in Peru: Bitel, Claro, Entel and Movistar. 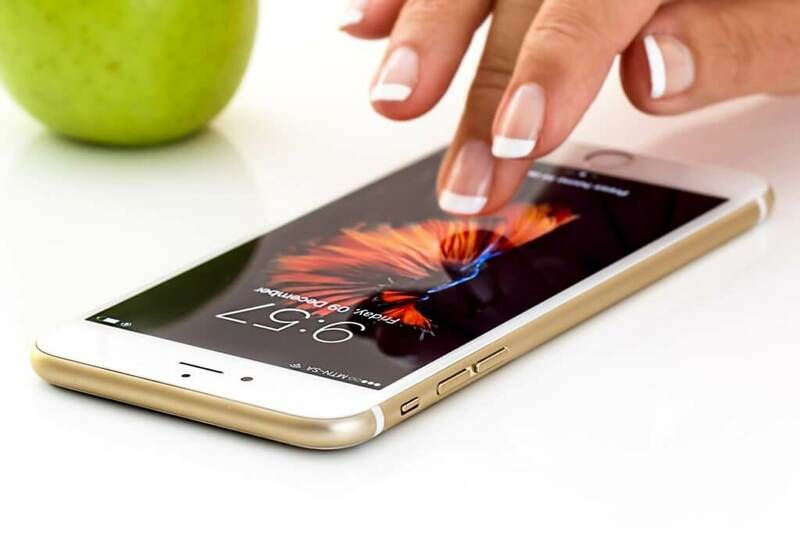 A recent study showed that Bitel has the best coverage in rural areas, especially as far as 4G is concerned. However, it also has the slowest download speed. In bigger cities like Lima, Cusco, Arequipa or Trujillo, you’re unlikely to run into big problems. Internet in the jungle regions and in the highlands is generally worse and slower than at the coast. I recommend buying your SIM card in an authorized store as they will help you with the registration and activation. However, don’t expect it to be a matter of minutes. You’ll have to wait until it’s your turn and then, they’ll ask for a lot of information, print out all kind of papers, send you to the cashier to pay and then they will finally activate your card. It will take at least half an hour but perhaps longer if there’s a long line. Don’t forget to take your passport with you. All stores are located in Avenida El Sol which is close to Plaza de Armas. And for more nomad-relevant information about Cusco, check out my guide here. Both in Lima and Cusco, many bigger supermarkets have counters of one or two telecommunications companies. However, I’m not sure if you can easily purchase your SIM card there and leave with a functioning phone. And most likely, the people who work there don’t speak English or only very little. The stores are normally open between 10 am and 6 pm. Buying new data is easy. It’s possible at every supermarket and any store which has a sign of the company you chose. You need to tell the vendor your phone number, the name of the telecommunication company and how much you’d like to recharge in soles. When I still had a prepaid card, I had a small piece of paper with all that information in my wallet which I showed the cashier. The new data will immediately be available and you will receive an SMS confirmation. 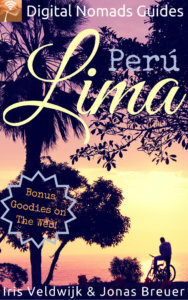 Do you need more information about Lima? Let’s have a closer look at the single companies and what they offer. I took this information from the companies’ websites and will keep it updated. Current information is from January 2019. I also went to all stores but Movistar. However, I was only able to have a nice conversation with the Bitel staff in Barranco, Lima. At the stores of Claro and Entel in Miraflores, there were long lines and I had neither the time nor the patience to wait just to ask some questions. I’m adding the links to all company website but none of them has an English version. Bitel offers three basic all-inclusive (todo ilimitado) plans which can be supplemented by more data (Click here for more information in Spanish). All plans include phone calls to the US, Canada and China. If you use up your data before your package expires, you’ll still have internet access but at a drastically reduced speed. Ti3 costs 3 soles and is valid for 3 days. It includes 200MB of data. Ti5 costs 5 soles and is valid for 5 days. It includes 650MB of data. Ti10 costs 10 soles and is valid for 10 days. It includes 1.5GB of data. With a prepaid card, you can add a maximum of 5GB for 20 soles to each of these packages. There are more options available: 150MB for 1 sol, 512MB for 3 soles, 1GB for 5 soles, 2.5GB for 10 soles. Click here for more information on these supplements (in Spanish). 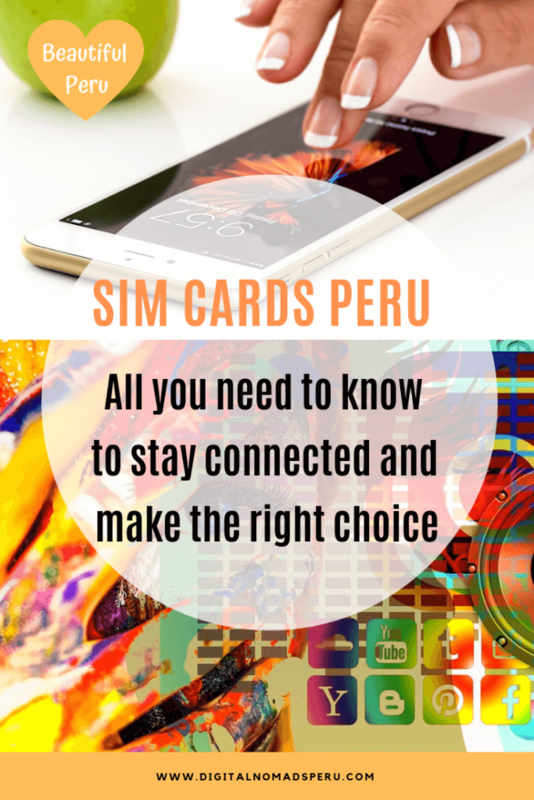 Personally, I’ve never had a Bitel SIM card but I mainly hear positive comments in expat groups or from other nomads and from my conversation with the staff at Bitel’s Barranco store, I’d say that they are pretty customer-friendly. As far as prices and rural coverage are concerned, Bitel is your best option. However, I wouldn’t recommend it if speed is important to you. Bitel mobile internet comes with an average download speed of 5Mbps. I have a contract with Claro and am happy with it as far as coverage and speed is concerned. When I work from cafés, I normally use my phone as a hotspot and in Lima, my average speed is 15/5Mbps. However, I’ve never been to really rural or jungle areas, so I can’t say how it works there. All these packages come with 30 days of WhatsApp. Means that even after your package has expired, you can still use WhatsApp. If you stay in bigger cities and intend to use your phone as a hotspot to work from cafés, for example, I recommend purchasing a Claro chip. 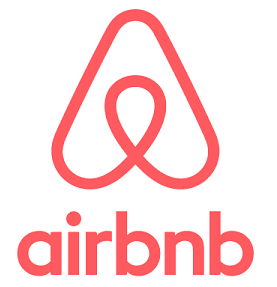 It’s slightly more expensive than Bitel but from own experience, I can assure you that it works like a charm in Lima, Cusco, Ica and Arequipa. 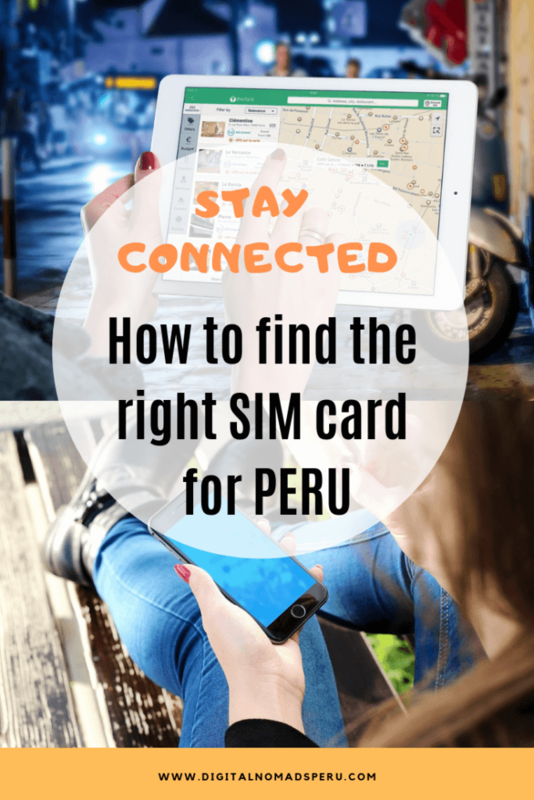 When I first came to Peru, I purchased an Entel pre-paid card simply because that was the first shop I ran into. Never had any issues but according to statistics, Entel has the worst G4 coverage. This used to be different in 2016 but since then, Bitel and Claro obviously invested more and have clearly passed Entel. Well, and two years ago, I never used my phone as a hotspot and was fine with 300MB data for a week. The information about prepaid plans on Entel’s website is confusing, too. They offer a tourist SIM card but it’s expensive. They’ll charge you 69 soles for 2GB and the possibility to add another gigabyte for 39 soles. No time frame, it seems but the price is ridiculous. In my opinion, it’s not an option for digital nomads. Their normal prepaid SIM card costs 5 soles, that’s the chip and 150MB data plus unlimited WhatsApp, Facebook Messenger and Instagram. You need to recharge every 7 days which will cost you 10 soles and will give you 300MB data. That means that 1.2 GB data for 28 days will cost you 40 soles. Definitely not worth it. Check Entel’s website for more information about their prepaid options in Spanish. Most people I know in Peru have Movistar as their internet provider at home but don’t use it for their phones. Movistar is supposed to provide the fastest mobile internet with an average download speed of 20Mbps but it also has a bad reputation as far as customer service is concerned and together with Entel, it has the worst coverage. Once again: This is most likely no problem in Lima, Cusco or Arequipa. WhatsApp, Facebook and Instagram are unlimited for all plans. This table compares the costs and data you get for app. 1 month of mobile internet in Peru. Please note that the coverage quality refers to mainly rural areas. Big cities in Peru normally have good or very good coverage. For information about speed and coverage, I used the information in this article. Buy a Claro chip if you spend most of your time in bigger cities and speed is important. Buy a Bitel chip if you plan to travel around a lot and mainly need to do normal stuff online, no Skype calls, for example. Did you like the post? Then why not share it on Pinterest. Muchas gracias.